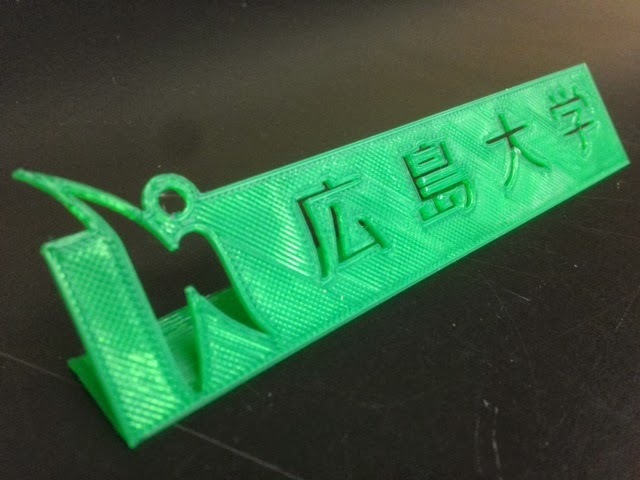 To celebrate today's visit to the JMU 3-SPACE classroom from a group of students from Hiroshima University, we them made a nameplate logo design in Tinkercad. Settings: MakerWare .3mm/low on a Replicator 2 with no raft and no support, oriented so the nameplate was face-down. Technical notes: To import the logo into Tinkercad we opened a .jpg of the design in Inkscape, converted to bitmap, and then saved in .svg format. You can see pictures from the Hiroshima University visit at the JMU 3-SPACE blog. Cool fact: Today marks the halfway point on our journey to 3D print and post about something every day for a year!